Imagine 11 effects, all capable of leaving your audience absolutely mystified and all achievable with NO SKILL!! 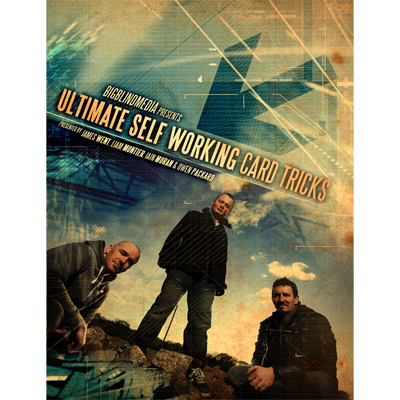 Imagine no longer... download Ultimate Self Working Card Tricks and perform your first self working miracle right now! This product will add 1.14€ to your cashback account. This really is excellent!! The tricks are really amazing especially considering they require no sleights at all!! I bought both volumes and wasn't disappointed! This download is NOTHING LIKE THAT. Bigblindmedia have sourced eleven of the greatest card tricks ever invented. Magical effects that will simply SLAY audiences. And each of these tricks just so HAPPENS to be self working. That's the key. These tricks are easy enough for a beginner, but STRONG ENOUGH FOR A WORKING PRO!!! And, even better, a lot of this material is very little known. Presented by James Went (host of CBBC's 'Help, My Supply Teacher Is Magic'), Liam Montier, Iain Moran and Owen Packard, the download contains tips & thoughts on how to present these routines, as well as a bonus section of some great false cuts if you want tyo take your magic to the next level. (You don't have to use these. These routines are all 100% sleight free! ).